Right after they moved my mom went to Germany for an art class and then a side trip to Vienna. She of course brought home all kinds of goodies for us. We got them in early July and I’ll have ya’ll know we still have almost ALL of the chocolate!! First is the stash of “grown up” chocolate, the boys must be angels if they want me to share any of these. The only one Josh and I have tried so far is the honey salted almond and it is fantastic! We also have red wine, chili, Jamaican rum, strawberry mint and iced coffee. While at the Ritter Sport store Oma also had special chocolate bars made for the boys. This year they did their research in advance and let her know what they wanted!! They are very excited about these chocolate bars. Notice how they like sprinkles and mini Smarties! 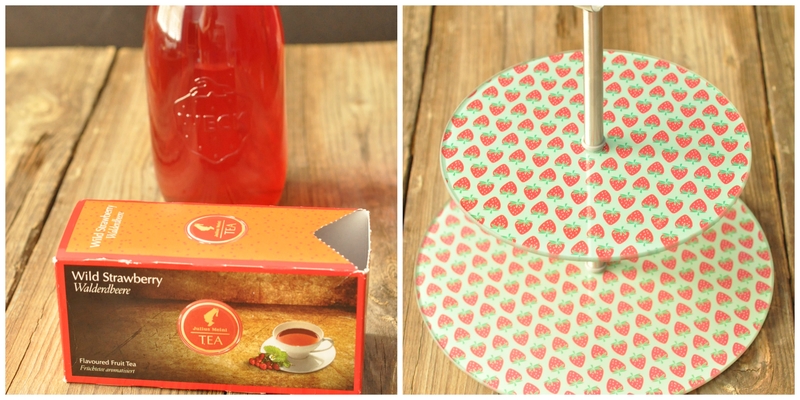 She also brought home this wonderful wild strawberry tea. I’ve been enjoying it iced. It’s so bloody hot here that I can’t think of hot tea very often, but this strawberry tastes fantastic over ice. Josh also got some coffee but I didn’t get a picture of that before he opened it into the canister and threw out the package. Along with the strawberry theme she also brought me this beautiful two tiered serving dish. Earlier in the month I made some dulce de leche which was very popular. 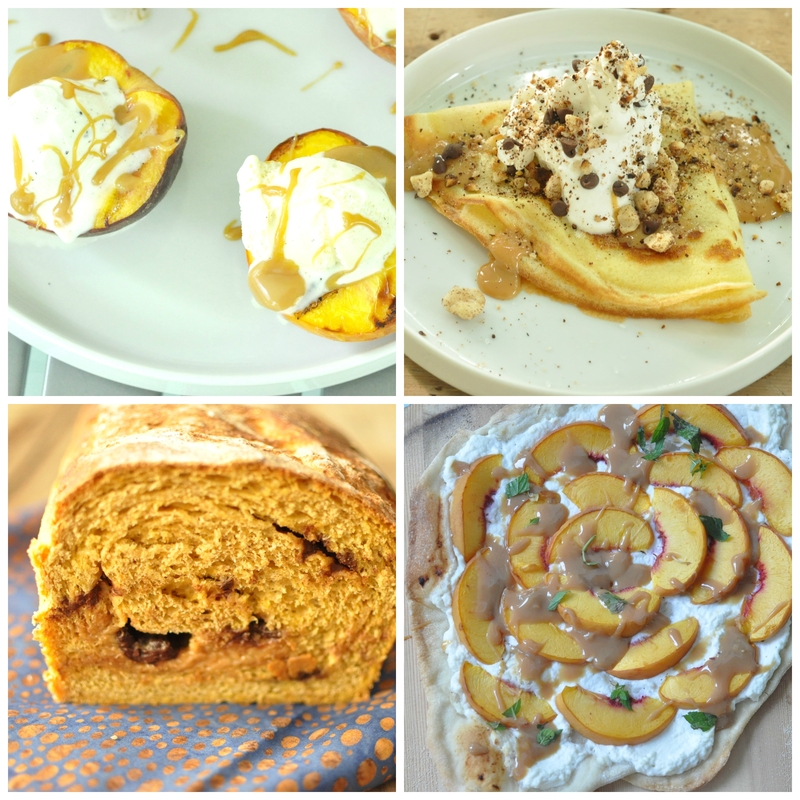 As I promised here are a few ways we enjoyed eating it….with roasted peaches and ice cream, in a crepe with toasted hazelnuts, in a pumpkin bread (based on this recipe) and on a ricotta peach pizza with fresh mint. They were all delicious and now our stash is gone! Speaking of the ricotta peach pizza, we make pizzas about every two weeks. It’s a fun weekend dinner, though even better in the winter as it heats up the house a bit. We really need to build an outdoor pizza oven someday! Here are the other three pizzas we made that same night. Eggplant parmesan using some eggplants from the market, roasted and made into a dip along with roasted tomato sauce and fresh basil from the garden. Prosciutto and arugula, a family favorite! 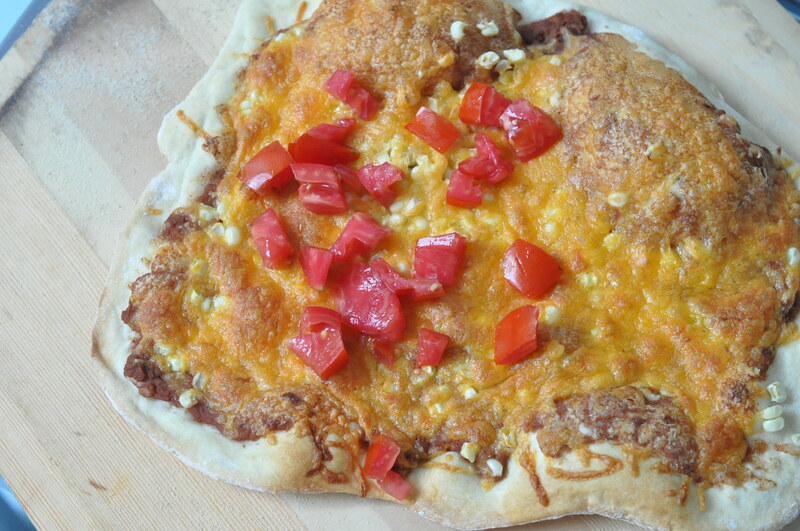 Finally, mexican using refried beans, corn from the market, cheddar cheese and tomatoes…with a tomato free zone for the kids! It may have been even better with shredded lettuce and crema but I didn’t have any, next time maybe. Here is what’s in my “camping kitchen”, or should I say Josh’s kitchen. We’re getting ready to go camping again and he has been a bit obesssed with making various camp stoves out of all sorts of cans. He goes to the store just to buy cans to make these stoves…canned green beans (yuck, I won’t eat them), Foster’s beer cans, canned chicken….luckily he may have finally found what he was hoping for. Yesterday he took one design for a spin in the backyard. Of course that meant I had to whip up some muffin batter and here is what happened…the batter gets placed in what is like a small cake pan which sits on it’s wire handle to avoid direct heat contact. That then sits in a sauce pan with a handle and gets covered. This all sits on top of a can which is on another can with fire in it. The end result was a delicous “camp cake” as Daddy called it. The boys defenitely approved! I believe that sums up our month. It’s so hard to remember yesterday, let alone what happened during the whole month! Next time we should have camping kitchen pictures as well as back to school lunches!! Or ready made dinners since swim practice starts up again this week and we will get home right about dinner time so there better be something ready for my little piggies. Don’t forget to check Celia’s comment section for links to kitchens across the globe. The dulce de leche was so incredibly drool worthy! Hubby just let me know we actually still have one jar left! I am definitely enjoying all the goodies I inherited from my parents, just wish they didn’t have to move away. Josh is a handy guy to have around. I paid a lot of money for a sophisticated camp oven that really was nothing more than 2 large pans sandwiched together. It made fantastic campfire pizza. So nice to keep your Mum’s things in the family, love the handmade cup and saucer! Enjoy the quiet…. The quiet can’t come soon enough! Once the boys are gone I can have a cup of tea in silence with my new cup and saucer! Hubby is very handy and I am definitely lucky to have him. His next project is to build me a pantry, I’m very excited about that. I love the handmade cup and saucer as it is gorgeous and can go for some of your peach pizza now too! Thank you for inciting me in your kitchen this month too! The peach pizza was incredibly delicious. My boys will be very depressed as peach season is about over! The cup and saucer are great, I’ll suffer through the heat to have some not tea with a scone next week! 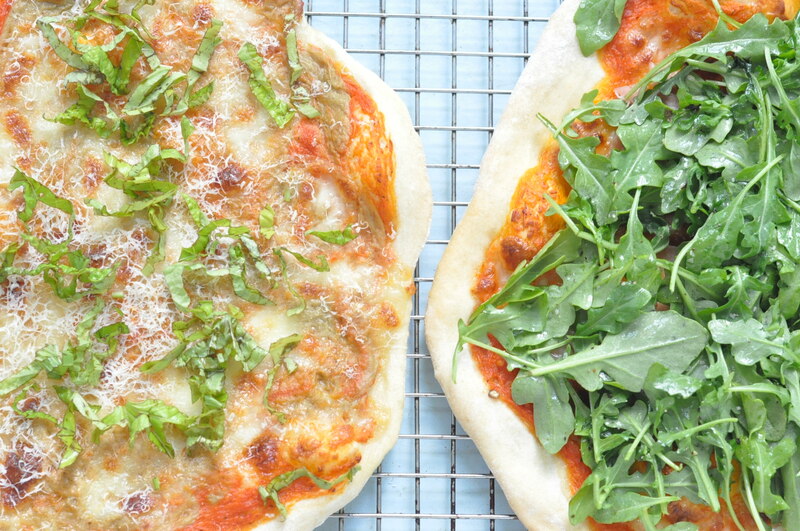 Your pizzas look great – we had pizza for dinner tonight too! Homemade pizza is truly the best! We have fun coming up,with different topping combinations. Someday I hope to get to the Ritter Sport store myself. It wasn’t around when I was last in Berlin, either that or I somehow missed it. The custom bars are brilliant! All my boys, big and small, have fun with all the campfire experimenting. As for the dulce de leche, oh yum! Hubby read this post last night and let me know about an error, we still have one jar left. Happy days! Gretchen, I love that oven. It is so cool. We have several different models! Hubby had lots of fun researching and designing. The boys enjoy watching the fire! Man, fire, food…seems to all go together! The boys are starting to get hooked on cooking in the backyard too. Custom chocolate bars are definitely amazing, I limited the boys to three add ins though or they would have gone crazy! I use Jamie Oliver’s crust recipe, adding a little semolina. It’s great because it makes so much, I freeze half. That gives me enough for about a month since we make pizzas every two weeks or so. It’s fun coming up with different topping combinations. This time of year though it’s all about garden tomatoes! Ricotta peach pizza. Great idea! Keep enjoying those outdoor cooking experiments. It was a delicious pizza! The ricotta and peaches would go well on toast with a drizzle of honey too. Great camping kitchen and oven and looking forward to viewing more of these. I rather fancy one of those crepes too. Delicious. We will have more camping adventures soon enough! Thanks for stopping by. It’s always dangerous when I make dulce de leche. I eat most of it before it gets bottled! Love your camp cake. I bet that would go nicely with a dollop of dacle de leche. Dulce de leche is indeed great straight off the spoon! We are enjoying our found last jar, what a wonderful surprise. I am still in chocolate heaven! The favorite is red wine truffle by Zoller. Thanks for popping by. look at those wonderful pizzas! such fun to make too. yum to dulce de leche. love the cups and saucers. 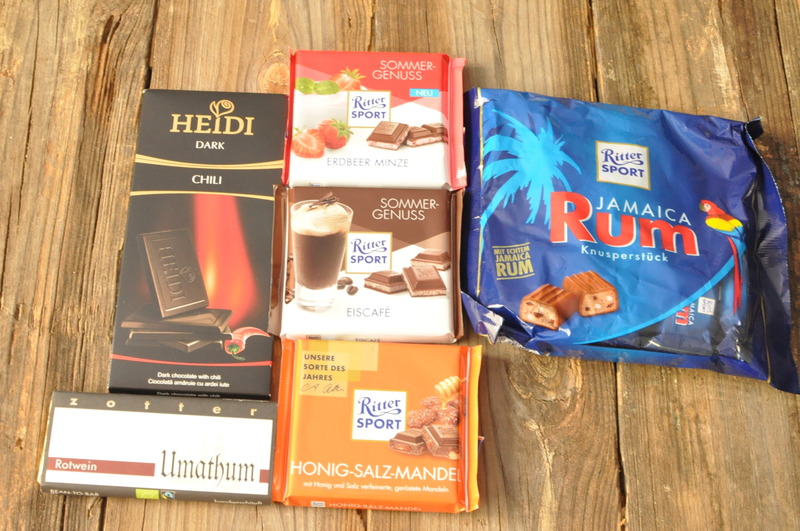 and ritter sport dark choc with hazelnuts is one of my fave chocs. Thanks! Dulce de leche is very popular here for obvious reasons. Family pizza night is also a favorite, it’s always fun coming up with new toppings. I have just been admiring the pizzas, because I shall be making one for lunch today and I still didn’t know what to add to it. These look awesome. I shall borrow some ideas for mine. Have a great week ahead. I have to go shopping for some Mozzarella cheese right now. Thanks for always visiting my blog. my regards to your family! Thanks Liz! We just did pizza night again Sunday and love it. Mew have so much fun coming up with toppings. I’ve come to love the Jamie Oliver crust recipe with just one change by adding semolina. We can get a super thin and crispy crust which I love!